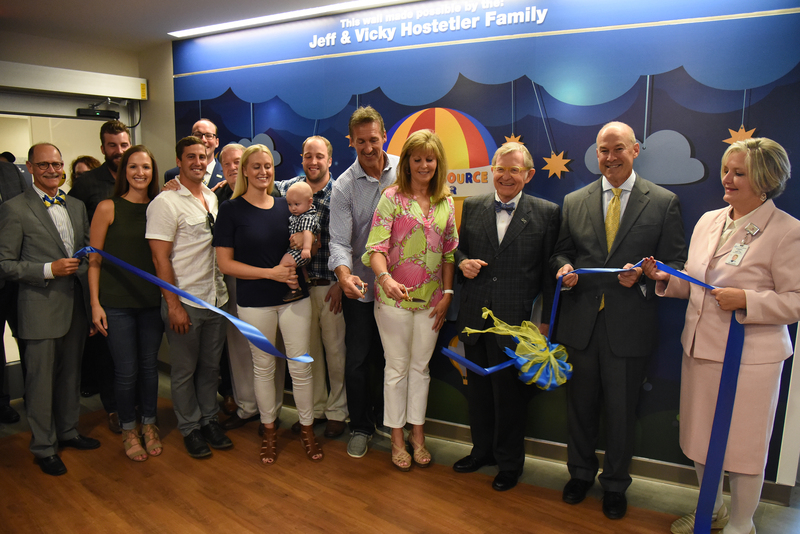 MORGANTOWN, W.Va. – Families who find themselves at WVU Medicine Children’s, away from home and struggling to adjust to their new circumstances, can now find resources and support at the Jeff and Vicky Hostetler Family Resource Center, which was dedicated today (Aug. 8) at the hospital. Giving back is nothing new for the Hostetlers. In 1991, the year that Jeff led the New York Giants to victory in Super Bowl XXV, he and Vicky created the Hoss Foundation as a way to provide assistance to children and families facing hardships due to traumatic injury, illness, or financial crisis. Over the years, they have used their focus of family and faith to guide not only their lives but the Foundation as well. As the parents of three sons – who, at various stages in their lives, have needed the care of a children’s hospital – Jeff and Vicky understand firsthand what families and, more importantly, children go through during their stay at the hospital. This led them to become members of the WVU Medicine Children’s Leadership Council, where they could advise and promote community involvement. This involvement and their children’s experiences led the family to focus their time on creating the Family Resource Center. According to Philip Saul, M.D., executive vice president of WVU Medicine Children’s, the Hostetlers’ $750,000 gift to create the Family Resource Center is especially important now, when more patients and families than ever before are choosing Children’s for their healthcare needs. For more information on WVU Medicine Children’s, visit www.wvukids.com.